Lagoon Amusement Park Entertainment Auditions Friday, January 28, 2011 at the Covey Center for the Arts Studio Theater. Check In: 3:30 p.m. Open Audition: 4 pm -6pm Callbacks: 7 p.m.
All candidates must be 16 years old by March 21, 2011. Prepare two contrasting songs, bring legible sheet music in the appropriate key. Pre-recorded accompaniment on CD is allowed, however, CDs of the original artist performing main vocals are not allowed. No cassette tapes. You may be asked to attend a call back the same day as your audition. Those who audition will learn a dance combination. Please bring appropriate dance attire, a head shot and resume. Rehearsal and performance dates may vary upon the specific production. Some shows will begin rehearsal as early as March. All positions are paid hourly for rehearsal and the season. Please complete and submit an online application before Friday, February 18, 2011. Interviews will be conducted by invitation only. Invited interviews will be held on Monday, February 21 and Tuesday, February 22, 2011 at the Lagoon Annex. 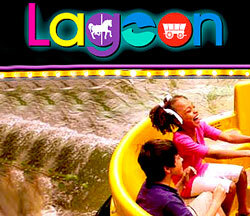 For more information, visit lagoonpark.com/auditions or call 801-451-8059.